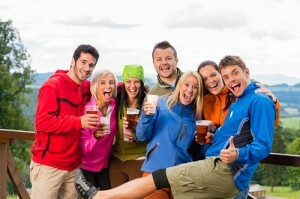 Snowy Mountain Brewery was included in Travel Pulse’s “5 Unique Beer Vacation Spots in the U.S.!” Check out what they had to say about our brews below! We love them both. Put them together and you may as well be in paradise. Whether you are scaling the West Coast or you find yourself in the Northeast, there are plenty of fantastic spots that offer great beer, cozy lodging, exhilarating entertainment and boundless adventure. The key is finding them. Fortunately for you, you’ve come to the right place. From Oregon to Vermont, you would be wise to spend your beer vacations at these places. Located in the small town of Saratoga, Wyoming, Saratoga Resort and Spa not only boasts nine house beers at Snowy Mountain Brewery, it’s also a dream world for outdoor enthusiasts. Whether you are into fly fishing, golfing, snowmobiling, hunting, ATV expeditions, horseback riding, hiking, biking, kayaking, cross country skiing, ice fishing, snowshoeing or birding, Saratoga Resort and Spa will accommodate you from season to season. Did I mention there is a natural hot springs on site? By the time you’re done exploring this spectacular resort, you city slickers may forget you even hailed from the city at all.